Stenographer, Laboratory Assistant, Driver, Lab Technician, Data Entry Operator DEO, Steno typist, Peon, Assistant Grade III. Bilaspur University has released this Notification to fill up total 53 Jobs through Online mode by visiting its Official Website of http://www.bilaspuruniversity.ac.in/ from 13th February, 2017 to 06th march, 2017. Selection Process of Peon, Laboratory Assistant, Lab Technician etc Jobs will be through written test and Interview conducted by Bilaspur University. 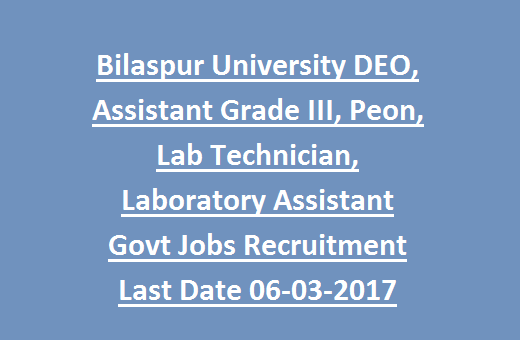 All details of Bilaspur University Data Entry Operator DEO, Assistant Grade III, Peon, Lab Technician, Laboratory Assistant Jobs Recruitment 2017 mentioned below. 1. Availability of Online Application forms is 13th February, 2017. 2. Closing date for Availability of Online Application forms is 06th March, 2017. 3. Closing date of Application Fee is 08th March, 2017. 3. Issue of Peon Admit Card will be notified soon. 4. Tentative Peon Written Exam date will be updated soon. As per Bilaspur University Recruitment 2017, total Available Vacancies are 53. 1. 5th class passed for Peon Jobs; 10th passed for Laboratory Assistant Jobs; 12th passed for DEO, Stenographer, Steno Typist Jobs; graduation is the Qualification for Lab Technician, Assistant Grade III, PA of Vice Chancellor Jobs. 2. ME/ M.Tech in discipline of Computer Science OR M.Sc / M.C.A is the Qualification for Programmer Jobs. 1. Rs.4,700/- to Rs.7440/- with Grade Pay of Rs.1300/- per month for Peon Jobs. 2. Rs.9,300/- to Rs.34,800/- with Grade Pay of Rs.4300/- for PA of Vice Chancellor Jobs. 3. Rs.15,600/- to Rs.39,100/- plus Grade Pay of Rs.5400/- per month for Programmer Jobs. 4. Rs.5,200/- to Rs.20,200/- plus Grade Pay of Rs.2400/- or Rs.1900 per month for remaining Jobs. Selection Process of Peon, Laboratory Assistant, Lab Technician etc Jobs will be through written test and Interview conducted by Bilaspur University. 1. For Peon, laboratory Assistant Jobs, Application fee is Rs.150 for SC/ ST candidates; Rs.300/- for all others. 2. Application Fee for Programmer Jobs is Rs.440/- for SC/ST; Rs.700/- for all others. 3. Remaining Jobs Application Fee is Rs.250/- for SC/ ST candidates; Rs.500/- for all others. 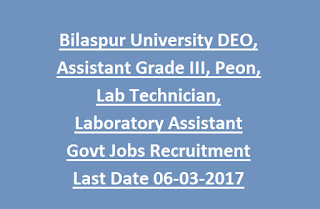 Interested candidates may apply for Peon and remaining Jobs through Online mode by visiting its Official Website of http://www.bilaspuruniversity.ac.in/ from 13th February, 2017 to 06th march, 2017.